Through the use of various mediums and styles, World War I combat artist Harry Everett Townsend, of Connecticut, provided compelling insight into the vast spectrum of emotions and circumstances that resulted from the demands of war. Townsend was one of eight accomplished World War I combat artists sent to France by the American Expeditionary Forces. Townsend was born in Illinois in 1879, and resided in Norwalk after the war’s end. Townsend attended University of Wisconsin, but transferred to the Art Institute of Chicago to pursue his art career. Several of Townsend’s illustrations were on display at the New Britain Museum of American Art in 2017. 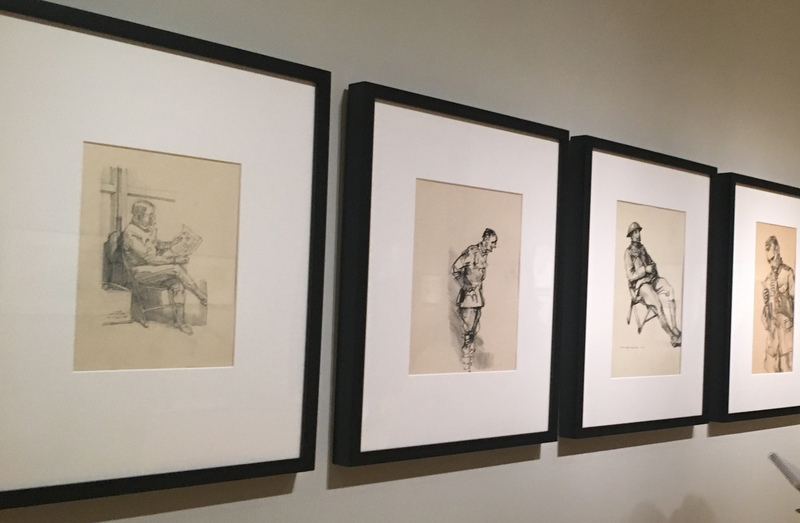 Monahan said his favorite drawing of Townsend is Infantryman, which depicts a soldier sitting and smoking a cigarette, drawn with charcoal on paper. Townsend first began his war service in 1914 by drawing propaganda posters for the U.S. War Department, according to the Connecticut State Library. On Feb. 15, 1918, he received a letter from major general William Black, chief of engineers, and U.S. Army, in Washington, D.C., notifying him that he had been recommended to serve as a combat artist, according to U.S. War Department records. Soon after, Townsend and seven other artists were commissioned as captains in the Engineering Reserve Corp., giving them full access to all aspects of the war, according to state records. The Army’s intent in sending artists abroad was to create artwork from their direct observations and generate historical documentation that could be used to shape the public’s understanding. The other seven U.S. combat artists were Dunn, William James Aylward, Walter Jack Duncan, George Matthews Harding, Wallace Morgan, Ernest Clifford Peixotto and J. Andre Smith, according to the book “Army Art of World War I” by Roger Kennedy and Harold Nelson. 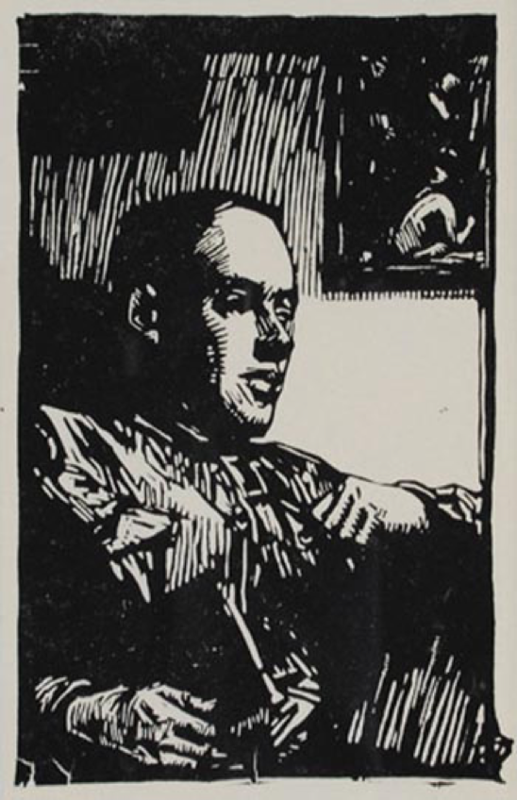 Harry Townsend’s “Self Portrait,” published by The Print Connoisseur in New York, 1930. On May 1, 1918, at the age of 39, Townsend reported for duty in the U.S. Army American Expeditionary Forces in Neufchâteau, France, according to U.S. War Department records. The letters demonstrated a difference in expectations between Townsend and the war department. Townsend felt personally responsible to accurately depict the precisions of the Great War for historical purposes, while the war department wanted more illusory, romanticized images of the war for propaganda use. Monahan said The Great War completely transformed America, leaving the country as one of the prime movers in world politics and economics. “The 20th century was the century that came to be the American century; it was absolutely critically important, World War I,” said Monahan. After the war’s end, Townsend spent time carefully crafting additional depictions of World War I in his Paris studio before moving to Norwalk in 1921, according to Deputy Director of The New Britain Museum of American Art, Min Jun Kim. In Norwalk, he worked for the WPA Federal Arts Project from 1935 until he passed away in 1941. He created the town murals, “First Settlers in Norwalk” for the Benjamin Franklin Junior High School, and “The Purchase of Norwalk” in the city hall council chambers. He was also a member of nine Connecticut art associations, according to the Connecticut State Library.